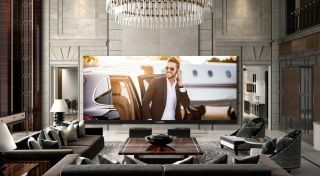 C Seed 262 is the world's largest 4K TV | What Hi-Fi? This monster spans a ridiculous 262in diagonally - that's nearly 7m. But you can hide the screen using a motorised fabric cover. Russian oligarchs, lottery winners and people with more money than sense, listen up. Here is the world's biggest 4K TV. The C Seed 262 spans a prodigious 262in diagonally - that's 6.65m, or the size of about three and a half six-feet-tall people. MORE: What is Ultra HD TV and 4K TV? It comes with its own built-in 4K media server and six integrated speakers. There's also a motorised fabric cover to conceal the screen at the touch of a button, maybe in case someone easily startled comes round. Good luck getting it into your lounge, though - it weighs 800kg. It's available now, though there's no word on a price. We're guessing it doesn't come cheap.